The Presidents' Trophy was presented to the NHL in 1985-86 by the League Board of Governors to recognize the team compiling the top regular-season record. 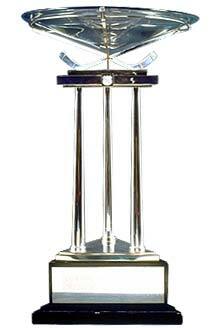 In case of a tie, the team with the most wins is awarded this annual trophy. Leading winners (including 2005-06): Detroit Red Wings (6), Calgary Flames, Colorado Avalanche, Dallas Stars, Edmonton Oilers, New York Rangers, Vancouver Canucks (2). The winner receives $200,000, to be split evenly between the team and its players. The Edmonton Oilers were the first-ever winners of the Presidents' Trophy in 1986.